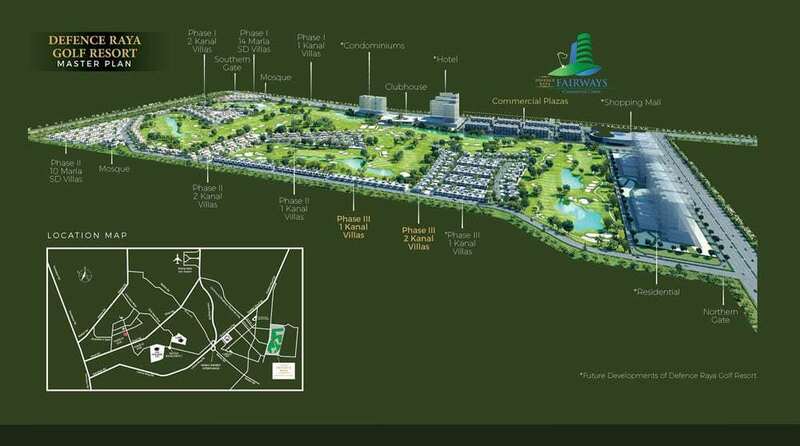 DHA Lahore open booking for Defence Raya Golf Resort Phase III. Booking includes 1, 2 Kanal Villas and 8, 10 Marla commercial plazas. Booking offered on key turn basis (progressive payment plan). a. Cash /PO /DD in favor of “Defence Raya Ballot” will be deposited with any branch of Askari Bank Ltd.
b. All applicants will attach one passport size photograph and two photocopies of computerized National Identity Card / Overseas National Identity Card. c. Acceptance of applications is subject to approval by DRGCC. DRGCC may accept or reject any application without assigning any reason for all categories. d. Successful applicants will be required to fulfill requirements of registration with DRGCC for each allotted Villa/Commercial Plaza. f. An applicant can apply for any number of Villa/Commercial Plaza subject to payment of application fees for each Villa/Commercial Plaza separately. Submission of applications in Banks / DRGCC Y Block Office during Office hours (by hand or through courier) from 09 May, 2016 till 23 May, 2016 (last date of submission). Balloting will be held on 21 June, 2016. Ballot result will be announced on DRGCC Website on 23 June, 2016. The Website announcement will be considered as official notification. Intimation to successful applicants will be dispatched by official letter from DRGCC on 27 June, 2016. Refundable amount of Application Fee in respect to successful applicant shall be adjusted in the 5% booking amount. The allotment of Villa/Commercial Plaza to successful applicants will be subject to payment of 5% (as a booking amount) of total sales price to be paid within 14 days of ballot result announced on DRGCC Website and another 15 % (remaining down payment) in next 14 days, failing to pay either of the above amounts the allotment shall be treated as cancelled and 50% of refundable amount will be forfeited. And applicant would be dis entitle from claiming any right in the Property (Villa/Commercial Plaza). List of Villa/Commercial Plaza along with offer prices and location plan are annexed to this application form. Balance amount of Villa/Commercial Plaza is payable as progressive payment plan annexed to this application form 20. 5% discount will be offered on full lump sum payment of the Villa/ Commercial Plaza Sales Price by successful applicants within 14 days of ballot result. a. Applications will be received by all branches of Askari Bank Ltd from 09 May, 2016 till 23 May, 2016. Now balloting for DRGCC has been made. Kindly inform what would be time line of construction of 1Kanal villas. Please contact DHA Lahore directly for all queries regarding development & possession etc. Atif bhai is it recommended to apply for DRGCC 1 kanal villa as the prices are around 6 crore? Are these villas over priced? I mean is DHA offering these villas below market rate? I am asking all these questions because i want to apply for these Villas but i donot have such a huge amount to pay for installments, so is it possible to sell the villa with some profit if i am a successful applicant? In fact Installment package is given for those who cannot pay a lump sum amount but can pay the same in installment. Installment plans are actually a facility to make an assets with the passage of time. I do not recommend booking or buying for such gain or short term profit. it may or may not. So it is a good facility to help buyer who can afford this much heavy installment but still cannot pay lump sum. If you are going to mature the Villas by paying its all installments it is recommended. Although the Quality of Bahria Town Safari Villas, Bahria Town Homes, DHA Homes, DHA Villas, Defence Raya Villas, All Askaris or any other developer houses are usually not good. A private builder house is much better in quality as compare to these house or villas. But definitely these are gated communities and are more secure then any other. In fact it will have an impact on DHA Phase 6 Prices. Also new commercial cutting will have an impact on DHA Phase 6 prices. In fact prices now start taking gain in Phase 6, 7 & 8. Phase 9 Prism is now at 100 to 125 without development charges for top locations plots. Prices are different for each unit (Villa & Commercial). DHA is following the same patron as “DHA Plots for Sale 2016”. Property number, size and other details are already given. You have to select the specific unit to apply. For example if you are applying for 1 Kanal Villa, you have mention number of Villa for which you are applying for.